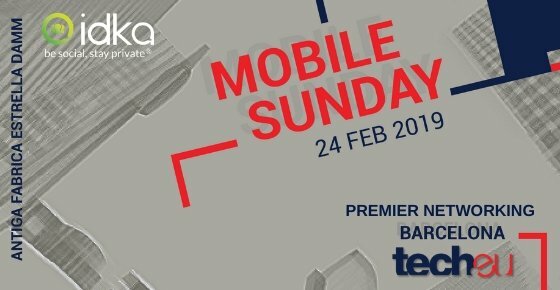 On Sunday the 24th of February from 6 to 10PM, Tech.eu is hosting a fresh edition of Mobile Sunday, the premier networking event in Barcelona that has happened the evening before Mobile World Congress and the 4YFN Conference since the dawn of mankind (rough estimate). We’re looking forward to an evening of deep conversations with experts on stage, any kind of conversation during the networking hours, many Estrella beers in the Spanish brewer’s amazing old factory, some exquisite street food to make sure nobody goes hungry, and much more. Join hundreds of entrepreneurs, investors, mobile industry executives, journalists, policymakers, ecosystem spinners and more and get your tickets now! Entrepreneur, teacher, dad, angel investor and currently global head of the entrepreneurship initiatives of the Telefónica Group, Miguel runs the operator’s 11 Wayra open innovation hubs and 50 open future spaces around the world. Straight from Silicon Valley, Jessica is a seasoned industry analyst and founding partner of Kaleido Insights, and emerging technology advisor specialising in consumer-side IoT, blockchain, and AI. Her area of expertise is on the application of sensors, machine learning, service automation, and consumer protections in B2C or B2B2C businesses. From Google to Yandex to OLX to ZeptoLab and then into the world of investing at 500 Startups and other organisations, Diana recently became the director of international business development and investments at Tencent, the Chinese Internet services juggernaut. An expert on entrepreneurship and early-stage financing of startups, Itxasio recently joined Notion Capital in London after launching M12 (Microsoft Ventures) in Europe. Based in Stockholm, Göran is the founder and CEO of Idka, a new social media service dedicated to security and protecting users’ privacy. He also recently became a respected member of the Forbes Technology Council. We are aiming to keep the schedule relatively light to allow for deep fireside chats with the exceptional people listed above alongside the networking part of the evening, though we’re likely to add a number of speakers and/or startup pitches in the coming weeks. Stay tuned for that, and feel free to get in touch with speaker suggestions. See you in Barcelona soon? Get your tickets now before prices go up!